When arriving from the direction of Liège: E25 in the direction of the Ardennes > E411/A4 in the direction of Brussels > Namur > Neufchâteau > take exit 25 > follow the traffic signs ‘Bouillon’. When arriving from the direction of Luxemburg: A6/E25 in the direction of Arlon > Brussels > Namur > take exit 25 > follow the traffic signs ‘Bouillon’. 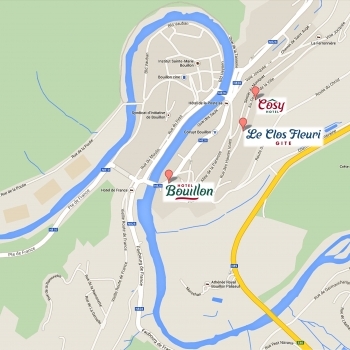 In Bouillon, follow the traffic signs ‘Cosy’ or the signs of our neighbouring hotel Panorama. Do you have any questions regarding our hotel? Please ask them here.